Growing your own food and gardening the day away can be fun and relaxing. It can also be frustrating and downright disappointing. One way to mitigate the possible frustration is to do your homework before you ever start planting. Trust me. I wish I had taken my own advice. A great (and pretty simple) step to doing your due diligence is to try your own soil test. 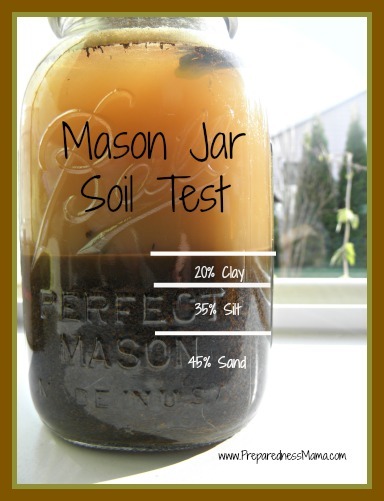 All you need for this little test is a mason jar, some elbow grease, and a bit of time. Knowing what percentage of clay, sand, and silt in your soil can help you understand what you might need to add or modify to get your garden going. The brilliant Shelle Wells over at Preparedness Mama helps people find ways to be self-sufficient and get prepared.